The 3/4 ounce 7/8 inch by 4 1/2 inch fishing spoon is a must have for your fishing tackle box. Now you can have crank bait action in a spoon. Unique wobble action is the key to catching finicky fish. No other fishing spoon offers this action. With genuine&nbsp;nickel plate fish scale finish the lure reflects more light to attract fish from greater distances in low light or stained water conditions. This fishing lure has multiple holes in the lip to adjust the wobble action from fast to slow. It is perfect for trolling, casting or jigging. Our salmon spoons are catching limits in salt water and fresh water. CLICK ON PHOTO OF SPOON TO ENLARGE. Badger Tackle fishing spoons and fishing lures have been tested in the field by charter captains on salmon, fresh water and salt water game fish. All fishing spoons come with a VMC extra strong red treble and nickel single hook for every angler preference. Research has shown red hooks catch more fish! Our Fishing lures run well at a wide range of trolling speeds. 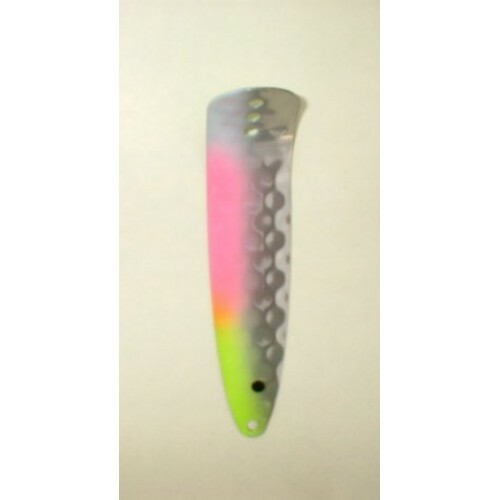 This magnum size heavy durable lure will handle even the largest of fish. It is recommended to use a cross lock ball bearing snap swivel for all presentations to maximize the action. The Nestor 3/4 ounce weight also works well for casting from boat or shore. 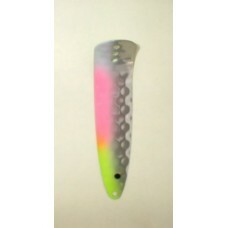 Will flat line troll at 2 to 4 feet excellent for first light fishing. It is a proven killer for all game fish!